At the beginning of this year, the APRL released a digital version of The Postage and Telegraph Stamps of British India by L.L.R. Hausburg, C. Stewart-Wilson, and C.S.F. Crofton, originally published in 1907. The digital version of this rare book was scanned by Penn State University Libraries from the APRL’s fragile copy and made available for sale from the APRL. The APRL also scanned Supplement No. 2 (The Essays, Proofs, and Reprints of the First Issued Stamps of British India of 1854-55 by E.D. Bacon), and included it in the digital edition. One of the people who bought this digital edition alerted us to a number of missing plates, as well as to the existence of Supplement No. 1 (New Discoveries in the British India Stamps of 1854-5, Printed in India by L.L.R. 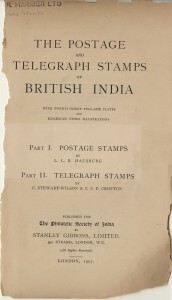 Hausburg, published by the Philatelic Society of India in October 1916) and “Appendix to the Third Edition of ‘The Essays, Proofs and Reprints of the First Issued Stamps of British India of 1854-55’” published in The Philatelic Journal of India in April 1933. We looked at our original and discovered that we were, in fact, missing plates. 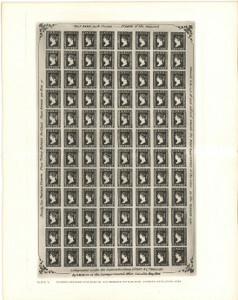 Our first step in locating images of the missing plates was to search the Philatelic Union Catalog. We discovered that the Collectors Club, Greene Foundation, Royal Philatelic Society London, and Western Philatelic Library also had copies of this book. We contacted Roger Skinner at the Western Philatelic Library in Sunnyvale, CA, to find out if that copy of the book had all of the plates. Roger confirmed that it did, and scanned the missing plates for us. Meanwhile, we located the first supplement and the appendix in the APRL collection and scanned them using our book scanner. We are now pleased to offer a revised and expanded digital edition of The Postage and Telegraph Stamps of British India for sale in the APS Digital Publications shop. If you purchased the original digital edition and would like to upgrade to the new edition, please contact Tara Murray for options.